If you want to experience something which isn't for the weak-heartened, then you could visit the catacombs in Paris. Here you'll find long narrow passages and rooms filled with skulls and bones. As if that wasn't enough, it's human bones, and they've been rather creatively arranged . Somebody really spent a significant amount of time creating these bone-walls. You're left to wonder what sort of persons would spend days and months stacking femurs and skulls in patterns, not to mention, some are even humorous. A question arising is how would a place like this come into existence. It's certainly not something that happened over the years, even if that could be a fascinating story. The real story is more morbid though. A couple of hundred years ago, by the end of the 18th century the cemetery Cimetière des Innocents were so filled up that they had to dig up all the old bones and move them to another location. The cemetery had been in use since the 13th century, and was in the 1870s a picture of stuffed mortgages and mass graves filled with rotting corpses. Paris is filled with subterranean passages and tunnels. Many were created during the mining of limestone which has been used to build with since the Roman era. 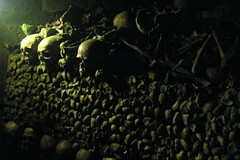 So under Paris there was plenty of space to place bones from Paris' overloaded cemeteries. It took nearly a hundred years to move the many bones. By then they had moved the remains from more than six million people from more than 30 cemeteries in Paris. There are approximately 1,7km passages, 20 metres below the surface, which are accessible for the public. Montmatre is one of the most charming areas in Paris. It's where the artists gather, and great names joined groups and lived. Of famous artists we can mention Salvador Dali, Claude Monet, Pablo Picasso and Vincent van Gogh. The area is clearly influenced by its artistic history and is today an important tourist destination which plays upon its glorious past. The neighbourhood is located on the tallest hill in Paris, north of the city-centre. The hill can be seen from afar and the top is crowned by the basilisk Sacre Coeur. The streets winds around the hill, steep and narrow, filled with real Parisian magic. 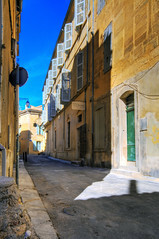 You will find lots of small shops, street artists who offers to paint your portrait, cafés, and restaurants. There's also a rich night life with bars, pubs, and nightclubs. Famous carberets like Moulin Rogue and Le Cat Noir is also to be found in the neighbourhood. It borders Pigalle, which is one of the redlight districts of Paris. It is certainly worth a visit, if you can keep up with the many stairs and steep streets.